So we made it to Queenstown by the end of the afternoon. Me, Susann, Amber and Danielle went to our backpackers hostel while Rob, John, and Jennifer checked in their hotel. Later on, we met in the center of the city because it was the opening night of the Winter Festival. For the occasion, there were singers, food stands, and fireworks as well. After the fireworks, we all went to this bar called the Red Rock and stayed there for a few hours before going to bed. Saturday morning, after breakfast, we watched the Winter Festival Parade. 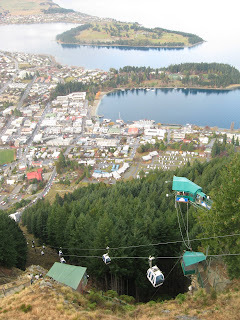 Shortly after, we made our way towards the bungy jumping site. Today was THE day to JUMP!!!! OMG I was starting to feel quite nervous. So we took the gondola uphill to reach the top of the mountain. The view up there was spectacular. If you look at the picture below, you will see a little green station. well that is where we were about to jump. WWWAAAA! Feeling more nervous than ever, we checked in and got ready for the jump. 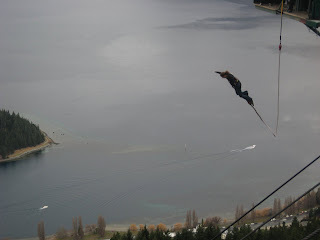 This Bungy Jump is called the Ledge and is an "urban" jump. We were not attached by the ankles but rather by the whole midsection of the body. Therefore, we had to run and jump off. I got the DVD of the jump. I posted it on Facebook. It is worth watching. So here I am, jumping. It was NUTS! After talking about the jump non-stop for a while, we went in a mexican restaurant and spent the rest of the afternoon there. Then we went home to take a nap and met up again later on for a good night of celebration. On Sunday, after waiting almost 1 hour for my omelette (grrrrrr), we went up Coronet Peak to check out the view, and also because we had heard that it was the station's grand opening party. Turned out that there was no party at the time. 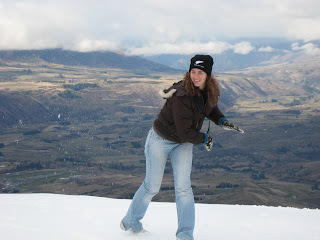 There were tons of skiers and snowboarders though, but since we did not come up for any of those 2 activities, we enjoyed the view and played in the snow for a little bit (it was the first time that I had seen snow on the ground in NZ). 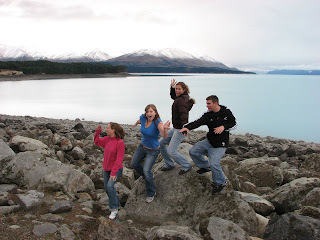 We left Queenstown on Monday morning. What a cool weekend! Avis à tous! / Listen up! 2 au 6 Juin = Première Semaine de Travail! 21 Juin - All Blacks!! !